As your organization transitions from selling products and print jobs to selling solutions, your sales techniques must evolve. The ultimate value of a print solution is not the printed product. It is the actionable results that come from the print. These results help your clients grow and achieve their specific business goals. This post is all about making those sales process changes. If you follow these guidelines, your sales performance will improve. Why do customers buy from your organization? What can you do that others cannot? What case studies or testimonials can you use? What skills or business practices differentiate you from competitors? What value and business results does your company help clients achieve? This goes beyond saving them money. You must be able to articulate how your services impact your clients businesses. Which potential clients on your list appear to have clear business goals and a desire to change? Companies satisfied with past performance are likely to continue the practices that generated those results. Their only objective is doing the same at lower cost. Expanding or evolving organizations are better matches for print-based business solutions. Why did your team win past deals, and what caused you to lose some? Effective sales teams have perfected processes that track and measure their effectiveness. Which accounts are worthy of the extra time and effort required to sell them a solution? Time is a commodity. 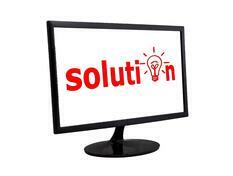 Solution selling can be a long process involving several people on both sides of the transaction. Be sure clients will give you access to the people and information necessary to craft an effective solution for them. commit. Solution selling doesn’t work that way. Companies are looking for partners who understand their business and can provide valuable solutions to help them achieve their desired goals. They don’t want to be sold your solutions. B: Be a resource - Offer ideas and strategies to help your customers and prospects succeed. C: Clarity - Be clear on the value you and your solution will deliver - monetize the value of your solution. R: Results – Focus on measuring what is important to the clients, not the cost of the solutions. Do the clients want more leads, more customers, more upgrades, more demos, or more attendees? Then develop a way to track progress towards these goals. Application Owners have a personal view of the potential solution. They want to understand how your solution will help them do their job or make it easier for them. Influencers are concerned with how your solution will help their company. They want clarity about how to align your solution with the organization’s goals. Decision Makers have a financial view of solution results. They want to know how your solution will impact the bottom line. Risk Managers are often a 4th type of decision maker influencing the outcome. They are looking for a clear business case justifying the investment. Risk Managers will weigh the risk of changing against the cost of doing nothing. As a solution seller you must understand the role of involved decision makers and how each client will evaluate their solutions and proposals in terms of time, cost, and quality. One effective method for sellers is “Yes Now”. Secure agreement to move forward in phases. Get a “yes” to a pilot, trial, or initial offer with a plan to refine the program based on tracked results. By focusing on results, “Yes Now” makes it easier for clients to say yes to something when they can’t commit to everything at once. When working through a client organization, both approaches can produce results. With a structured process to gain clarity on goals and objectives, you may find it easier to gather data going from the bottom up. When developing arguments about the monetary impact of a solution, working from the top of an organizational structure is more effective. Regardless of your approach to the org chart, you must be careful to clarify the next steps in the decision process, identifying the key decision makers involved. These individuals may change over time. Clear and concise communication throughout the sales process is essential. Record all action items from meetings. Plan short, clear presentations or follow-up communications understandable by someone who did not attend the meeting. Your documents, emails, and presentations must sell for you when you are not in the room. They must connect with decision makers you may not get to meet until later. Raise the bar in your communications. Samples, demonstrations, mock-ups, and proof-of-concept materials are all important. Presenting these items are key milestones in a good sales process. You can make a big difference in your sales success rate by selecting the right time to use them. Do not present samples at the first meeting. You don’t have enough information yet about the client’s objectives, their decision-making processes, or the people involved. Chances are good you’ll miss the mark and lose credibility by showing materials and mock-ups too soon. Only present visual examples after you are clear about the desired results and how you solution aligns with your client’s goals. Identify the decision makers and critical influencers. Then demonstrate for them how your solution meets their defined needs. Remember that customers are not buying print. If you’ve made a solution sale, they have agreed the print service provider will allow them to achieve their business goals, resolve their issues, show a return on investment, and impact their end-customers. They are buying results from the printer, not paper and ink. Use the tips above to change your approach and win more often.